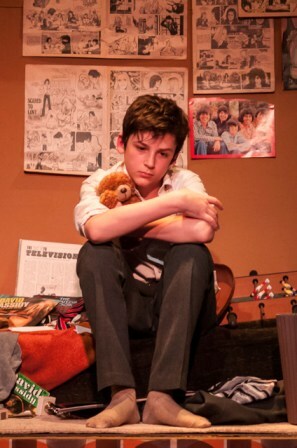 (seen at the preview performance on 6th March 2016). 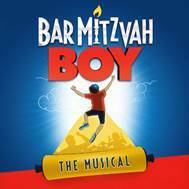 “Bar Mitzvah Boy” lasted just 77 performances at Her Majesty’s Theatre in 1978. … Comparing the original recording and liner notes to this version, this Bar Mitzvah boy gets the major haircut his parents were urging. The team goes back to the 1976 award-winning TV drama for its script and dramatic structure, cuts the cast to 8, the band to 4 and circumcises the odd wonderful number (sorry, fans, “Thou Shalt Not” is gone, but trite “The Sun Shines Out of Your Eyes” is still in, alas) in favour of newly-written stuff from the original composer’s bottom drawer. Fortunately, it’s mostly the better for it. Eliot (above) is about to turn 13, his synagogue Bar Mitzvah service happens tomorrow morning, with a catered party for 117 (even the Cohens are coming!) to follow. 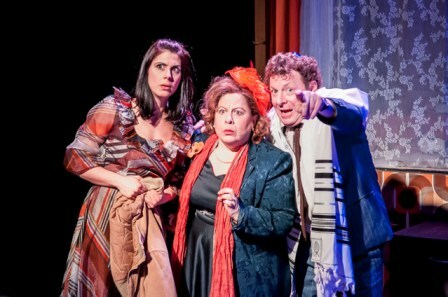 We first encounter young Eliot (Adam Bregman) at home, introducing his family and squabbling with sister Lesley (Lara Stubbs), as Rabbi Sherman (neatly observed by Jeremy Rose) looms. Through the night, parents alternately worry more and congratulate themselves and Eliot trembles, until ‘the day’ dawns. Just when it’s all going right, Eliot’s big moment arrives. He makes good his escape in front of the entire community, and gentle mayhem ensues. And those paragraphs are the major issue with the show. The entire first half is a very long set-up – and act two doesn’t quite repay an audience following really quite mundane happenings. The resolution of Eliot’s funk happens three times in the second half, dissipating our emotional reactions over nearly 30 minutes, rather than giving a single glorious release, as a good musical should provide, to leave all happily deflated and glowing in the aftermath. Still, there’s plenty of good along the way. Foremost, the adult male casting is faultless. 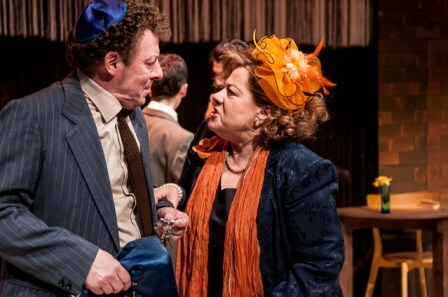 Rober Maskell’s patriarch is gloriously observed, the archetypal Jewish father reduced to a ‘non-speaking / wallet carrying role’ by his womenfolk. Hayward B Morse is a Jewish Granddad straight from ‘Central Casting,’ and if only they had cut his ‘joke’ to a punchy (or at least less hoary) tale, he’d have achieved perfection. Nicholas Corre, already a “Victor in training” deserves special mention for his act 1 highlight song-and-dance solo “The Harolds of This World.” Later, his facial reaction to a casual insult is a joy to behold. He also makes a decent cup of tea. Sue Kelvin and Lara Stubbs take longer to find their characters, but when they do, this mother and daughter combination are a formidable team. Kelvin in particular was still working on her emotional pitching at the preview I saw, not quite achieving the perfect level of mania until too late in proceedings, denying her the opportunity to go further when required. Stubbs sings beautifully, becomes the sister Eliot needs (both pictured above), and almost doesn’t deserve Harold – who will do very well for himself with her. 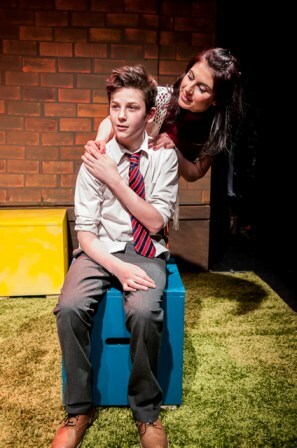 Of the two youngest cast members, Hannah Rose-Thompson is perfection, oozing early teen angst and hilarious bluntness with a maturity both in character and performance style that steals every scene from young Adam Bregman. If director Stewart Nicholls could only re-stage their interactions so more than 10% of the audience could see them, it’d be perfect. Bregman tries hard, but doesn’t always find himself in the 1970s. A hugely inappropriate early smirk distances him from our affections, but he wins through eventually, the audience joining in the cry of “Mazeltov” as the curtain falls. Grace Smart (who had the extreme misfortune to be forced to sit next to me at the performance, as all other seats were taken – sorry, Ms Smart) produces an impressively detailed set. 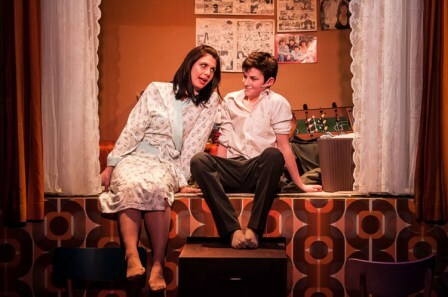 If you think “Back in Time for the Weekend” was accurate, Smart goes further, producing a single wall ingeniously containing authentic wallpaper and synagogue window, two bedrooms, a kitchen, beaded curtain (concealing the band) and playground. Expect authentic 70s hairdryers, “Jackie” pin-ups, flying ducks, cutlery and crockery (IKEA, noch, so she confided!) too. One very impressive piece of stagecraft and costuming, adding immeasurably to the piece, and worth all that careful research. Less careful, I had several quibbles over the handling of the Jewish prayers (a holy name is used – potentially gravely offensive to some of the audience), and atrociously edited synagogue sequence (overlong enough to be cut anyway). Also inexplicable, even the Rabbi confusing “bar mitzvah” with “being bar mitzvahed” (one exists, the other does not – Bar Mitzvah is automatic on the 13th birthday, “barmitzvahed” is the circus of celebration at the core of the show). Given the faith of most of the team, they may have been able to adjust a little more, perhaps? Clawing things back, here are marks to be had for the decent band, authentic sounding arrangements and well-chosen pre-show and interval music, though. What more can I say, I’m happy, I should cry? 4 Stars of David, Mazeltov, Eliot.